See how sophisticated the handmade life can be with the Fall 2012 issue of knit.wear magazine. We're refining the art of knitting with a look at machine-sewing your handknits, a lesson on choosing the perfect cast-on and bind-off, and 25 lush, tactile garments with clean lines and timeless appeal. See how sophisticated the handmade life can be with the Fall 2012 issue of knit.wear. We're refining the art of knitting with a look at machine-sewing your handknits, a lesson on choosing the perfect cast-on and bind-off, and 25 lush, tactile garments with clean lines and timeless appeal. Browse the Yarn Notebook to find The Finer Things, a review of exquisite fibers spun gossamer-thin. Yarn blends include baby alpaca, lambswool, angora, cashmere, silk, bamboo, and more! Find out why machine sewing and handknitting can go hand-in-hand with Seams Great. Learn about general seaming tips, finishing edges, how to secure edges before cutting, an overview on installing zippers, and get tips for installing buttonbands. Join Ann Budd and knit.wear staff in Start to Finish: The Cast-On and Bind-Off Encyclopedia. Learn several new basic cast-ons, provisional cast-ons, decorative cast-ons, and new bind-offs, all with detailed instructions and diagrams for each step in the process. Learn where fiber art, handknitting, and ready-to-wear meet in From Figure to Fiber: Julia Ramsey's Knitted World. See Julia's exquisite fiber installments and learn to appreciate the beauty of raw material. 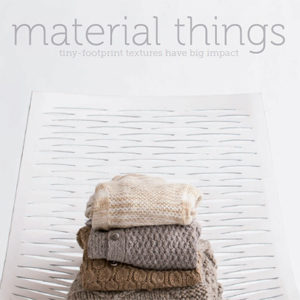 Material Things focuses on tiny-footprint textures that have a big impact on the garments they grace. The Lattice Cardigan features chain-mail inspired patterning for a deep, tactile texture. Other projects include undulating dimple stitches, broken rib patterning, and twisted stitches combined with stockinette and seed stitches. These knitted projects are all about thermal warmth and depth of patterning. Open Up features decreases, yarnovers, and strong shapes to create garments out of sculptural openwork fabrics. The Octagon-Dot Pullover is made up of dozens of join-as-you-knit pieces to create a mosai-like tee perfect for layering. Other projects include surprisingly simple lace elements, laceweight yarn for elegant drape, and curves created by careful decreases. These garments are perfect for the layer-filled days of fall and spring. Nip/Tuck features garments that are pulled, scrunched, ruched, and tucked, and emphasizes that knitting doesn't happen in two dimensions. The Waved Wrap transforms columns of ribbing into long, undulating waves using tucks and gathers. Other projects include dense cables, a deep lattice patterning, and buttons framed by carefully-created tucks. Each of these projects promises to keep the knitter intrigued, both while knitting and while wearing. 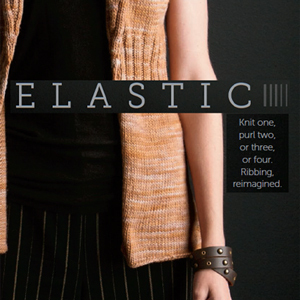 Elastic features reimagined ribbing in a variety of garments to create stretch and gathers that add intrigue and elasticity. The Hourglass Sleeve Pullover is a basic raglan pullover with ebb-and-flow ribbed hourglass patterning on the sleeves. Other garments feature ribbing in every style from subtle to deep, ridged ribs that add stretchy shaping. 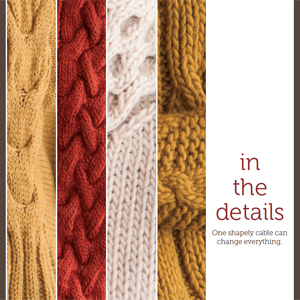 In the Details features shapely cables that, when carefully placed, change everything about their garments. The Honeycomb-Collar Pullover features a bold, broad funnel neck shaped with rope cables. Other garments feature asymmetrical cable edging, horseshoe cables, and reversible cable edgings. 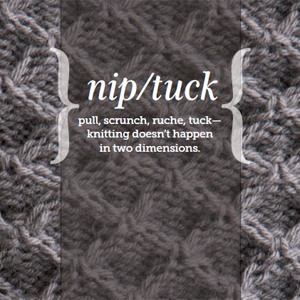 with your copy of knit.wear Fall 2012! Lovely edition with great projects.